מָקוֹם שֶׁנָּהֲגוּ לוֹמָר בִּרְכַּת אֲבֵלִים שָלֹש אוֹמְרִים שָׁלֹש, שְׁתַּיִם אוֹמְרִים שְׁתַּיִם, אַחַת אוֹמְרִים אַחַת. מָקוֹם שֶׁנָּהֲגוּ לוֹמָר בִּרְכַּת אֲבֵלִים שָׁלֹש כּוֹלֵל אֶת הָרִאשׁוֹנָה בִּתְחִיַּית הַמֵּתִים וְחוֹתֵם בָּהּ מְחַיֶּה הַמֵּתִים. שְׁנִיָּה בְּתַנְחוּמֵי אֲבֵלִים וְחוֹתֵם בָּהּ מְנָחֵם עַמּוֹ וְעִירוֹ. שְׁלִישִׁית בִּגְמִילוּת חֲסָדִים וְאֵינוֹ חוֹתֵם. בָּרוּךְ אַתָּה ה’ אֱלֹהֵינוּ מֶלֶךְ הָעוֹלָם הָאֵל הַגָּדוֹל בְּרוֹב גָּדְלוֹ אַדִּיר וְחָזָק בְּרוֹב נוֹרָאוֹת מְחַיֶּה מֵתִים בְּמַאֲמָרוֹ עוֹשֶׂה גְדוֹלוֹת עַד אֵין חֵקֶר וְנִפְלָאוֹת עַד אֵין מִסְפָּר. בָּרוּךְ אַתָּה ה’ מְחַיֵּה הַמֵּתִים. אַחֶינוּ הַמְּיוּגָּעִים הַמְּדוּכָּאִין בָּאֵבֶל הַזֶּה תְּנוּ לְבַבְכֶם לַחֲקוֹר אֶת זֹאת. זֹאת הִיא עוֹמֶדֶת לָעַד נָתִיב הוּא מִשֶּׁשֶׁת יְמֵי בְּרֵאשִׁית רַבִּים שָׁתוּ רַבִּים יִשְׁתּוּ כְּמִשְתֶּה רִאשׁוֹנִים כָּך מִשְׁתֶּה אַחֲרוֹנִים. אָחֶינוּ בַּעַל נֶחָמוֹת יְנָחֵם אֶתְכֶם. בָּרוּך אַתָּה ה’ מְנָחֵם אֲבֵלִים. אָחֶינוּ גּוֹמְלֵי חֲסָדִים בְּנֵי גּוֹמְלֵי חֲסָדִים הַמַּחֲזִיקִים בִּבְרִיתוֹ שֶׁל אַבְרָהָם אָבִינוּ שֶׁנֶּאֱמַר (בראשית יח:יט) כִּי יְדַעְתִּיו לְמַעַן אֲשֶׁר יְצַוֶּה אֶת בָּנָיו וְאֶת בֵּיתוֹ אַחֲרָיו. אָחֶינוּ בַּעַל הַגְּמוּל יְשַׁלֵּם לָכֶם גְּמוּלְכֶם. בָּרוּךְ אַתָּה הי מְשַׁלֵּם הַגְּמוּל. רִבּוֹן הָעוֹלָמִים פְּדֵה וְהַצֵּל מַלֵּט הוֹשַע עַמְּךָ יִשְֹרָאֵל מִן הַדֶּבֶר וּמִן הָחֶרֶב וּמִן הַבִּיזָּה וּמִן הַשִּׁדָּפוֹן וּמִן הַיֵּרָקוֹן וּמִכָּל מִינֵי פּוּרְעָניוֹת הַמִּתְרַגְּשׁוֹת וּבָאוֹת לָעוֹלָם טֶרֶם נִקְרָא וְאַתָּה תַּעֲנֵה. בָּרוּךְ אַתָּה ה’ עוֹצֵר הַמַּגֵּפָה. Blessed You Hashem, our God, King of the world, the great God, who in the multitude of His greatness is awesome and strong. Who in the multitude of His fearfulness resurrects the dead. Who with his pronouncement does great things without a reckoning and wonders without count. Blessed You Hashem, Who resurrects the dead. Our brothers who are fatigued [and] depressed because of this mourning! Pay attention to explore this. This stands forever. Such is the road (i.e. corse of events) since the six days of creation. Many have drunk, many will drink. The party of the first is like the party of the last. Our brothers! May the Master of consolation comfot you. Blessed You Hashem, Who comforts mourners. Our brothers, doers of kindness, sons of doers of kindness, who uphold the convenant of Abraham, our father, as it is said, “Because I knew that he will command his children and his household after him.” (Bereishit 18:19) Our brothers! May the Master of the reward pay you your reward. Blessed You Hashem, Who pays the reward. Master of the worlds! Redeem and save, rescue, salvage, your nation, Israel, from the pestilence, and from the sword, from the degradation, and from the blast [of wind damaging the crops], from the mildew [damaging the crops], and from all kinds of disasters that want [to come] and [actually] come into the world. Now we call [You], and You answer [us]. Blessed You Hashem, Who stops the plague. It is apparent from our Tosefta that although the content of the Berachot was similar, the text was not universal and that our Tosefta had a different version of the text of these Berachot than what is quoted in Talmud Bavli. It seems that the first part of the Tosefta is talking about the custom to say the Berachot, but without a specifc order or their subjects. However the second part of the Tosefta is talking about a different custom where there was a specific order to the Berachot and each Beracha had to be said on the subject mentioned. If you look at the Berachot quoted in note 2 you will notice that their order and subject roughly follow what is outlined in the Tosefta. The 1st Beracha is about resurrection of the dead, the 2nd one is about comforting the mourners, the 3rd one is about deeds of kindness, and the 4th one is a plea to God to save us from troubles. Obviously our Tosefta does not include the 4th Beracha on the subject of troubles. I am currently editing Tosefta Berachot and getting it ready for publication as a printed book. It should be ready within 1 month. For now I will post those Toseftot which have been significantly updated or changed. הָיָה עוֹמֵד וּמִתְפַּלֵּל בִּסְרַטְיָא וּבִפְלַטְיָא הֲרֵי זֶה עוֹבֵר פְּנֵי חֲמוֹר וּפְנֵי חַמָּר וּפְנֵי קַדָּר וְאֵינוֹ פּוֹסֵק. אָמְרוּ עָלָיו עַל רַבִּי חֲנִינָא בֶּן דּוֹסָא שֶׁהָיָה עוֹמֵד וּמִתְפַּלֵּל, נְשָׁכוֹ עָרוֹד וְלֹא הִפְסִיק. הָלְכוּ תַלְמִידָיו וּמָצְאוּ מֵת עַל פִּי חוֹרוֹ. אָמְרוּ אוֹי לוֹ לְאָדָם שֶׁנְּשָׁכוֹ עָרוֹד אוֹי לוֹ לְעָרוֹד שֶׁנָּשַׁך לְבֶן דוֹסָא. The Tosefta continues on the previous subject of not standing still while praying Shmoneh Esreh. Mishna 1 of chapter 5 says that a person may not move while praying Shmoneh Esreh even if there is a snake crawling on his leg. Our Tosefta seems to argue on that statement. סרטיא (Sratya), sometimes also spelled סטרטיאה (Stratya), is the Hebrew version of the Latin word Strata, which means a “main road”. Stratae (singular: Strata) were major roads inside a city, roughly 5 meters wide from which side streets, which were dead ends, lead off. See Daniel Sperber, “The city in Roman Palestine”, Oxford University Press, 1998, pp. 9, 103, 106. In fact, the English word “street” comes from the Latin word Strata. 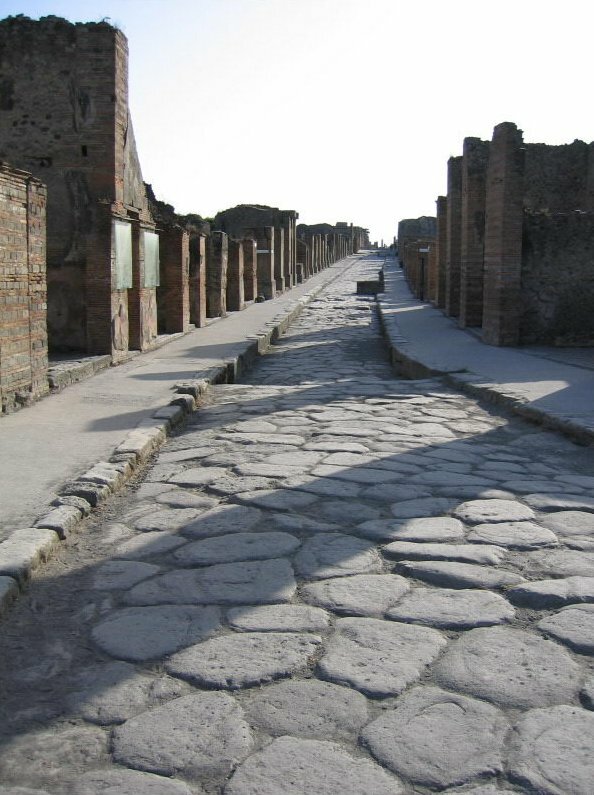 In the Roman world the Strata roads were paved, hence their name “Strata”, which literally means “paved”. Jastrow’s translation (Marcus Jastrow, Dictionary of the Targumim, Talmud Babli, Yerushalmi and Midrashic Literature, 2nd Edition, 1926, p. 1025, entry סרטיא) of this word meaning in this case a “camp” seems to be incorrect, at least in this context. Roman paved road in the city of Pompeii, Italy. This is what the Tosefta refers to by Sratya. פלטיא (Platya) is the Hebrew version of the Greek word πλατεία (Platea) and the Latin word Platea, both of which mean “a wide open area or street”, like a square or a plaza. In fact, the English word “plaza” comes from the Latin word Platea. See Daniel Sperber, “The city in Roman Palestine”, Oxford University Press, 1998, pp. 9, 104. 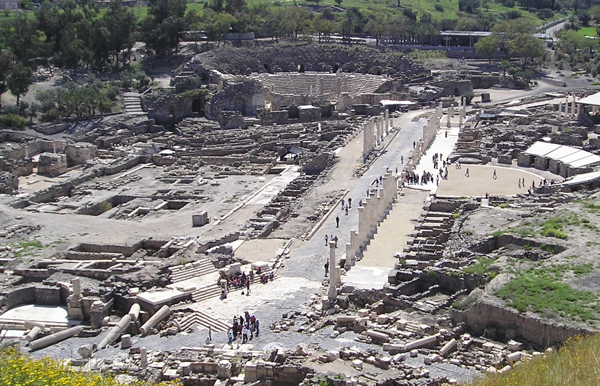 The view of the ruins of the Roman city of Bet Shean (Scythopolis), Israel. In the center of the picture is the main city street, Palladius road. Notice a Platea, a circular square, where a group of people is standing, on the bottom center of the picture, from which 3 different streets branch off. The Tosefta is teaching us that even though he had to move to get out of the way and he was not standing still he does not have to stop praying and start all over again, but rather he may continue. An Arod in our Tosefta is referring to some type of a lizard or a snake, but it is not clear which type. Talmud Yerushalmi (Berachot 5:1, Daf 38a) implies that it is poisonous. Talmud Bavli (Chulin 127a) implies that an Arod is a mythical creature which is born from a union of a snake and a turtle, which even the Talmud itself points out is physically impossible. If that is the case then most probably Rebbi Chanina ben Dosa was bit by a regular snake and later the story was exaggerated to say that it was an Arod to make it more impressive. Talmud Bavli (Berachot 33a) brings a slightly different version of this story in which Rebbi Chanina Ben Dosa let an Arod bite him on purpose so that the Arod would die. Rebbi Chanina Ben Dosa said that it is not the bite of an Arod that kills a person, but rather the person’s sins, and since Rebbi Chanina Ben Dosa did not commit any sins, God has killed the Arod instead for biting an innocent person. הכותב נכסיו לעבדו יצא בן חורין. אם שייר קרקע כל שהוא לא יצא בן חורין. רבי שמעון אומר הרי האומר כל נכסיי נתונין לפלוני עבדי חוץ מאחד מריבוא שבהן לא אמר כלום. חוץ מעיר פלנית ושדה פלונית אף על פי שאין שם אלא אותה שדה ואותה העיר זכה עבד זה בנכסים וקנה עצמו בן חורין. וכשנאמרו דברים לפני רבי יוסה אמר (משלי כד:כו) שְׂפָתַיִם יִשָּׁק מֵשִׁיב דְּבָרִים נְכֹחִים. Mishna Peah 3:8 mentions the case where a person gave away either all of his property or some of his property to his slave and if that automatically renders the slave free or not. This Tosefta expands on that case. It makes no difference whether the person is dangerously ill or healthy when it comes to giving away his property to his slave, because his slave is also considered to be his property which gets passed on to his inheritors and does not have an official termination point, like a marriage which disappears with the husband’s death. The most common way for a slave to be freed is by receiving from his master a document that declares the slave’s freedom called Get Shichrur (Bill of Freedom), which is similar in content to a regular bill of divorce. See Mishna Kiddushin 1:3 and Mishna Gittin 9:3. Therefore since this transaction of the master’s property in the end frees the slave it must be written in a contract and not merely verbal. According to Torah law slaves themselves are considered to be immovable property just like land. See Talmud Bavli (Shvuot 42b). However there is a question in Talmud Bavli (Bava Batra 150a-b) if slaves are considered to be like immovable or movable property in Rabbinical law. See Tosafot (Bava Batra 150a, Avda). Depending on how that question is resolved in that Sugya (Talmudic discussion) it would make a difference whether this Tosefta is talking about only immovable property or movable property as well. If slaves are immovable property even by Rabbinical law then the master would only have to give away all of his immovable property to his slave, but not his movable property. Since immovable property would include the ownership of the slave himself giving it to the slave himself is in reality giving him his freedom. However if by Rabbinical law slaves are considered to be like movable property then the slave would have to be given both the immovable property, in order acquire his freedom by Torah law and the movable property in order acquire his freedom by Rabbinical law. The conclusion of that Sugya seems to be that by Rabbinical law slaves are considered to be movable property and therefore in this Tosefta the master must give away both the immovable and movable property to his slave in order for the slave to acquire his freedom. There are two kinds of slaves that can exist by Torah law – Jewish (Eved Ivri) (see Shemot 21:1-5) and Non-Jewish (Eved Canaani) (see Vayikra 25:44). A Jewish slave is a very particular case of slavery which usually occurs when a Jew is unable to repay his debts to another Jew, all his possessions get taken away and he is forced to sell himself into slavery in order to survive or if Jewish thief is unable to pay back what he stole and is sold into slavery by the court. Non-Jewish slaves are simply purchased or captured in war. Either type of the slave can be freed by granting them the Bill of Freedom, Get Shichrur, and therefore the Tosefta can be referring to either type of slaves in this case. Since the slave is included into the property that the master gave to him he acquires his freedom. The Tosefta does not literally mean land, but movable property as well as was already explained above in note 4. Any size means literally “any size”, even if it is so small that a person cannot even stand on it, because land always has value to it. Since the master kept some of his property to himself, no matter how miniscule, it is considered that he intended to keep the slave as well. And even though the master wrote in the contract that he is giving away all of his property, since he kept some of it is clear that he did not intend to give literally everything away to his slave and therefore the slave does not go out free. Since the slave does not go out free he also does not acquire the property that he master gave him, because all property that the slave acquires is automatically acquired by his master. Meaning that the master did not specify which item he wants to keep, but rather he just said that one of them he wants to keep. Rebbi Shimon holds that since the master did not specify which item he wants to keep we assume that the item that he wanted to keep was this slave and therefore the slave does not go out free. Since the slave does not go out free he also does not acquire any other property that he master gave him as was already explained above in note 9. That is why Rebbi Shimon says that it as if the master did not say anything at all, because his complete proclamation ended up being in vain, since nothing got accomplished, not the freedom of the slave and not the slave’s acquirement of the master’s property. Meaning that the master specified exactly which item he intends to keep. Since the master specified that he intends to keep a particular city or field obviously he intended to free the slave, and therefore the slave goes out free and is therefore able to acquire all of the other property that the master gave him except for what the master specified that he wants to keep. According to the Tanna Kama even if the master specified which item he wanted to keep still the slave does not go out free, because we assume that the master intended to keep the slave as well and never referred to him in his other possessions. However Rebbi Shimon argues and holds that the master is capable to differentiate between the specific thing that he intended to keep and the slave. Talmud Bavli (Gittin 9a) explains that the reason for Tanna Kama’s opinion is that the Get Shichrur must contain a description of a single act that completely releases the property described in it. Since in this particular case it contained both an act of release for most of the property and an act of keeping for the particular item that the master specified it is not considered to be a complete document of release which makes it invalid and therefore the whole transaction did not take place. However Rebbi Shimon is not concerned with that and holds that since the master specifically indicated what he intends to keep and what he intends to release it is considered to be a valid Get Shichrur and that transaction described in it takes place. Rebbi Yossi’s name is sometimes spelled יוסי (Yossi) and sometimes spelled יוסה (Yosse), even though it refers to the same person. I have kept the spelling here that appears in all Tosefta manuscripts even though it may appear inconsistent with previous Toseftot. When Rebbi Yossi heard how much Rebbi Shimon’s statement makes more sense than the Tanna Kama’s he proclaimed about him the verse in Mishlei, meaning that a person who says something straight and correct deserves to be kissed. הכותב נכסיו לבניו וכתב לאשתו קרקע כל שהו – איבדה כתובתה. אמר רבי יוסי במה דברים אמורים? בזמן שקיבלה עליה לשם כתובתה, אבל לא קיבלה לשם כתובתה, מה שנתן נתן וגובה כתובתה משאר נכסים. Mishna Peah 3:7 mentions the case of the husband who is dangerously ill giving away all of his property while he is still alive to his sons and to his wife. The Mishna mentions an argument between the Tanna Kama and Rebbi Yossi regarding the wife’s eligibility of claiming the value of her Ketubah upon the husband’s death from the property that was given away to his sons if she received any land in this transaction. This Tosefta expands on this law and changes some of the details of the case itself and of Rebbi Yossi’s opinion. The reason that this law is mentioned here in Peah is because the previous Mishna (Peah 3:6) discussed a law regarding Peah that applied to a minuscule amount of land. Mishnayot Peah 3:7 and 3:8 discuss additional laws that have to do something with a miniscule amount of land even though they have nothing to do with Peah. The Tosefta does not comment on Mishna Peah 3:6, however it does comment on Mishnayot Peah 3:7 and 3:8, so it appears as if this and the next Tosefta are out of context, but really they are not. From this particular structure of the Tosefta it is clear that the Tosefta was written after the Mishna as an addition to it and not like some scholars claim that it was written before the Mishna. The Mishna (Peah 3:7) implies that it is only talking about a person who writes this contract is dangerously ill, however if he is healthy then this law would not necessarily apply and his wife would still be able to claim her Ketubah if later on he dies or divorces her. For an explanation of what the Ketubah is see note 7 below. The reason is because if the husband is dangerously ill then the wife assumes that this act of him giving away his property is his final act and she will not have any other rights to receiving anything from his possessions later on and so therefore if she does not explicitly say that she is still holding on to her right to claim the value of the Ketubah after his death she forfeits that right, because she implies that she is satisfied with this gift of land to her as his final will. However if the husband is healthy then the wife assumes that he is simply giving away a gift both to her and to his sons and this is not his final will then she does not forfeit her right to claim the Ketubah later if he dies or divorces her. In fact some commentators explain this Mishna in this way. See the commentary of the Rambam and Rav Ovadyah Mibartenura on the Mishna (Mishna Peah 3:7) and Pnei Moshe on Talmud Yerushalmi (Peah 3:9, Daf 18a, Avdah Ketubata). However the Tosefta does not mention whether the husband is dangerously ill or not, so it implies that this law applies in both cases, whether he is healthy or dangerously ill. The reason would be that since the husband is giving away all of his property and leaves nothing to himself the wife assumes that this is his final will and this is all she is ever going to get out of him in case of his later death or divorce, and therefore she does not have any future claims to the property that his sons received from him. The Rambam rules (Hilchot Zechiyah Umatana 6:9) that this law applies in both cases, whether the husband is healthy or dangerously ill. Since the Rambam himself wrote in his commentary on the Mishna that the Mishna is talking about only someone who is dangerously ill and not who is healthy it would make sense to conclude that the Tosefta argues on the Mishna and the Rambam rules according to the implication of the Tosefta and not according to the implication of the Mishna. In order for this case to make sense the husband has to give away all of his property, both movable and non-movable, and not just non-movable property (i.e. land), because theoretically the wife can claim the value of her Ketubah upon the husband’s death or divorce out of any type of property (see the next note) and since in this case he gave everything to his sons except for that miniscule piece of land that he gave to his wife, there is nothing of his property left in his possession for her to claim the value of her Ketubah in the future except to take it out of the property that was already given away to his sons. Talmud Yerushalmi (Peah 3:9, Daf 18a) explicitly makes this point in the conclusion of the discussion of this case. It is not clear from either the Tosefta or the Mishna if land is meant here literally or it is just an example and the same law would apply if the husband gave her some movable property instead. For a discussion of various opinions see Shaul Lieberman’s Tosefta Kepshuta on this Tosefta (Karka Kol Shehu, p. 141). Based on the premise that according to the basic law which existed at the time of the Mishna and the Tosefta the Ketubah can be collected from either movable or non-movable property the land in this case is just an example and the same would apply even to movable property. For a detailed discussion of the law regarding from what type of property the Ketubah could be paid from see Tosafot (Ketubot 51a, Memikarkai Velo Memitaltelei). Based on that Tosafot the statement of Rava in Talmud Bavli (Ketubot 51a) that the Ketubah could only be collected from land and not from movable property was a later Babylonian enactment of Rava himself and was not the accepted opinion in the Land of Israel at the time of the Mishna and the Tosefta, just like it is not the accepted opinion today. Daniel Sperber (See Daniel Sperber, “Roman Palestine, 200-400, The Land.”, Bar-Ilan University, 1978. p. 180-182.) points out that this particular law if the Ketubah can be claimed from movable property or not actually changed back and forth depending on the economic situation of the location, as can be seen from Talmud Yerushalmi (Ketubot 10:3, Daf 59a). Any size means literally “any size”, even if it is so small that a person cannot even stand on it. The word “loses” is spelled in all Tosefta manuscripts איבדה (Ibda), with the letter Yud, meaning “she loses” referring to the wife and not אבדה (Avda), without the letter Yud, meaning “it is lost” referring to the Ketubah, as it is written in some editions of the Mishna. The Rambam in his commentary on the Mishna (Peah 3:7) points out the correct spelling is איבדה (Ibda), with the letter Yud, because it is specifically referring to the wife’s ability to speak up that this gift of land is just a gift and she still keeps her right at a later time to claim the value of her Ketubah from the property given to the sons. And since the wife was quiet and did not explicitly say that this is just a gift she loses her Ketubah by her inaction. The accepted opinion is that according to Torah law when a man marries a woman he does not have to write any marriage contract that promises money to his wife in the case of his death or divorce. However the Rabbis have decreed that the husband is obligated to write a marriage contract called Ketubah in which he promises that in the case of his death or divorce his wife can collect out of his property 200 silver Denarii if this was her first marriage (i.e. she was a virgin when he married her) and 100 silver Denarii if this was her second or more marriage (i.e. she was a widow when he married her). See Mishna Ketubot 1:2 and Talmud Bavli (Ketubot 39b). Denarius (plural: Denarii) was the most common Roman silver coin in circulation at the time of the Mishna (up to the year 220 CE) and the amount of 200 silver Denarii was roughly equal to an average salary of an unskilled worker for half a year, based on the daily wages of 1-2 Denarii. See Avot Derebbi Natan (Schechter ed. Vienna 1887, page 27b, Nuscha 2, Chapter 26, Maaseh Behillel Hazaken), Talmud Bavli (Avodah Zarah 62a), and Tosefta (Bava Metzia 6:5). So this was a very significant sum of money that protected the woman financially from the husband’s sudden death or most importantly from a rash decision to divorce her, since by both Torah and Rabbinical law the husband can divorce his wife against her will. See Talmud Bavli (Gittin 21a). The remaining property after the wife collects the value of her Ketubah is inherited by his sons, regardless if they are also her sons or only his sons from another marriage, since by default inheritance by Torah law passes only from the father to the sons and not to the wife or the daughters. There are various exceptions to this rule if the husband does not have any sons; however the Tosefta is discussing a standard case where the husband has sons. The sons do not have any power of the wife’s claim to the Ketubah, so if their father gave all of his property to them during his lifetime, and later on when he died or divorced his wife he did no own anything, as long as the wife is still eligible to receive the value of her Ketubah, she can claim it out of the property of his sons, even though it belonged to them before his death or divorce. The Tosefta is discussing precisely this situation and the question is not whether she can or cannot collect it out of the sons’ property, because that is a given, but rather whether she is still eligible to the right to collect her Ketubah or not. Rebbi Yossi argues on the Tanna Kama and says that it is not enough for the wife to simply be quiet when she receives this gift of land from her husband and not speak up. Rebbi Yossi holds that she must speak up and explicitly say that this gift of land counts as the payment of her Ketubah, in which case she would be able to claim it later upon her husband’s death or divorce from the property that he has already given away to his sons. However if she was simply quiet and did not say anything it is not enough of an indication that this gift is intended to be her Ketubah payment and therefore she retains her right to claim it later. This clarification of the Tosefta is critical in Rebbi Yossi’s opinion, because from the way it is stated in the Mishna it is understood completely differently. The Mishna quotes Rebbi Yossi saying that if she accepted upon herself that this land is her Ketubah payment, even if the husband never wrote this gift of land to her in the contract, but only mentioned it verbally she still loses her future ability to claim the value of the Ketubah, because she intended to be given this land from the property received by the sons. According to the Mishna Rebbi Yossi is not arguing with the Tanna Kama in any way, but rather is adding a separate case to his statement. However, from the Tosefta it is clear that he is arguing, and if the land has not been explicitly written in the contract then for sure she does not lose her later ability to claim the value of the Ketubah, because then it is obvious that the husband is simply giving her a gift and not intending in any way for this to be his final will to his wife since he did not write it down. The way the Mishna presents Rebbi Yossi’s opinion is very peculiar, because he essentially says that it is possible to somehow nullify a written contract (i.e. Ketubah) with a verbal proclamation (i.e. the husbands unwritten promise to give her land). However from the Tosefta no such claim is made and Rebbi Yossi’s opinion is a lot more balanced, since according to the Tosefta, it is a written contract that nullifies the Ketubah and not simply a verbal proclamation.